I bet that you already have a smart phone and probably also a tablet like Apple's iPad or Samsung Galaxy 10.1 (our recommendation). Most likely you cannot see functioning without having these mobile communication tools readily available. Mobile CRM is designed to put detailed prospect and customer information at your fingertips and to enable you to perform key actions quickly wherever you are. Businesses need to adopt these technologies to enable mobile workers to become more effective and engaged with CRM. So you may ask yourself how mobile CRM can make a difference to my business and the way I stay connected to prospects and customers. 1. Real Time building of strong customer relationships. 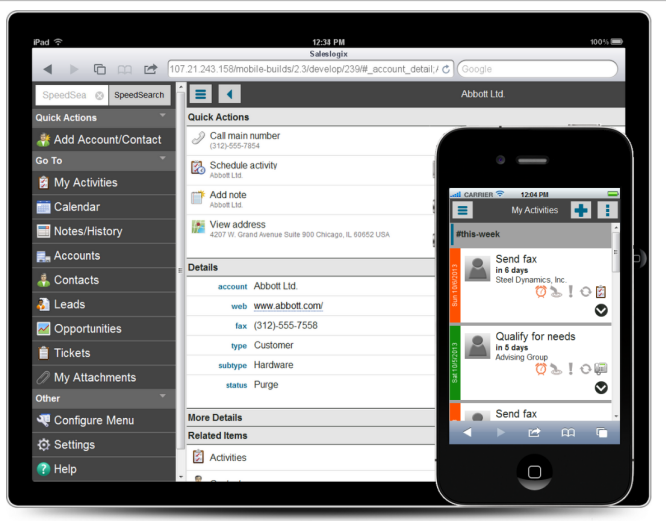 Mobile CRM allows your sales teams to more effectively manage their relationships in real time. Using customer history, call notes and service call information, you can make the most of customer visits, strengthen relationships and improve satisfaction. No need to wait till the end of the day to update your calling records. In real time you can make a phone call then immediately record the key notes of the conversation. With the newer mobile browsers you can simply and quickly record your voice notes to digital text and save this in your Saleslogix or Act! CRM with a tap of an icon. 2. Increase the performance of your sales team. Anywhere, anytime CRM access means the sales staff can respond to customer requests, manage appointments and update opportunities on the go. Down time between appointments can be made productive by accessing contact information and make needed updates. There is a reduced need for multiple calls from the road to gather what the sales team needs. Now the entire office is up to speed on what is happening in the field. Having this real-time information on the companies a sales person calls upon this handy with Mobile CRM is bound to increase performance. 3. Closing more sales and in less time. With immediate access to customer history, sales reps can do business anywhere, anytime. Closed sales can occur while on the road or at the customer site. No need to call back to the office headquarters and ask about what has been occurring. Today the sales person can tap on a customer account record and get the quick 360 degree view of the account and recent activities. While there in CRM they can easily update the status of opportunities. Now sales management is happier! 4. Increase the productivity of your service teams. We have a client that provides roofing systems and it requires a field service rep to perform site visits and do warranty work. Now the service rep can take some helpful photos, send them back to the service desk for review and get direction on the resolution steps. While analyzing the situation he can check on a digital attachment of the original service work performed. Giving users the ability to get basic information while out in the field for a service company is a huge benefit. Mobile CRM allows your staff to use familiar mobile devices which help them to become more comfortable with CRM and work more efficiently. 5. Reduce administrative tasks and paper work. The ability to create quotes within minutes and allow managers to provide approvals online via mobile devices can be accomplished. Endeavor CPQ - configure, price and quoting allows our clients to provide what the prospective customer wants right there and reduces related admin work. By using mobile devices to document the outcomes of customer meetings or service calls, staff can reduce paperwork. Why not save our precious trees? As a side note since the sales activities are easily being entered in the mobile CRM system, the time needed for filling out call reports is eliminated. Now the sales manager can dynamically run sales rep activity report anytime. A strategic advantage of mobile CRM is the ability to get real-time information and reduce errors resulting from re-keying through data collection in the field on hand held devices. With mobile access, you can reduce the number of sources of data entry, resulting in reduced errors, improved data accuracy and increased real-time data availability. One of the best ways to be remembered positively is by delivering exceptional service. It may be at quick call back with a quickly retrieved solution in your CRM database. It may be the review of your latest notes that later allow active listening. These remarkable experiences which a customer receives drives up the value of your offerings. The building of relationship is easier for engagement on both parties. And your sales teams are equipped to successfully manage their relationships in real-time. Nucleus Research found that providing sales people with mobile device access to CRM drives a 14.6% productivity increase. Imagine everyone in your organization having immediate access- anytime, anywhere - to the information they need, when they need it. From the employees' point of view, it liberates them and improves active engagement. For the managers' point of view you are giving them flexibility and you get back valuable rewards. Really helpful Mobile CRM is here.... are you ready? Getting it done NOW - capturing speech to text to update contact conversations quickly.